Body Language & Emotional Intelligence: Negotiation Body Language Secret # 1014: What Do You Call an Ex-Knight? What Do You Call an Ex-Knight? What emotions or intentions are signaled by an Asymmetric Smile? One possible tell beneath this nonverbal clue is an Insincerity - being acted and forced onto the face. It's wearer does NOT feel true Joy-Happiness. It does not mean that the person as a whole is necessarily insincere, but in that moment the expression is feigned. If chronically displayed however, the knight ... er, ah person has been measured and found wanting. The second major emotion that should come to mind when an asymmetric smile is seen is Contempt. Unilateral nostril flaring is often also present. When contempt is subtle or even moderate, many mistake it for a coy smile. 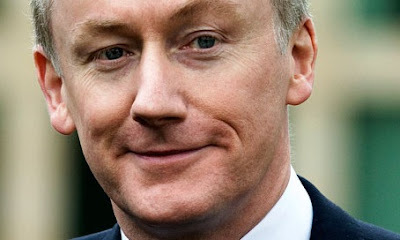 Fred Goodwin, pictured above was Knighted in 2004. Yesterday his Knighthood was "cancelled and annulled" by the Queen "on the advice of her government and the Honours Forfeiture Committee" as the CEO of the Royal Bank of Scotland (RBS) and for its role in the financial crisis.